Our third episode features lots of modern bands giving new polish to the Retro Wave sound! Much of this comes out of the Darkwave and EBM scene but many are bands who’s full albums follow in the same vein. Special Thanks to Metropolis Records, Cleopatra Records, Interscope Records, and NINSource [FREE Downloads]. 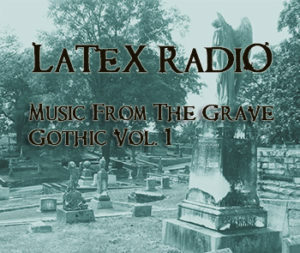 Episode Two of Latex Radio is a collection of Gothic music old and new with a mostly traditional flavor. Expect many more Gothic and Darkwave episodes in the future as well.